Pressure Ulcers, medically coined as 'decubitus ulcers' have been a major threat for rehabilitation of bed ridden patients for about a century, as these ulcers eventually leads to fatality. Managing the ulcer is very challenging so the best option being their prevention. There were two broad theories behind the etiology of its formation namely neurogenic and mechanical. Therefore intervention should also be neurogenic and mechanical. Neurogenic intervention is to prevent the chance of occurrence of stroke and other neurological pathologies while mechanical intervention is to prevent the accumulation of excess pressure under ulcer vulnerable regions. The skin over bony prominences are said to be pressure vulnerable regions. There were various technology developed to prevent the formation of ulcers. This paper will review existing technology and will add more on what is needed for early prevention. Decubitus ulcers, Pressure sores, Smart beds, Geriatric rehabilitation, Stroke rehabilitation, Bed ridden complications. For the geriatric population, in particular, and stroke patients in critical/ acute care settings the Pressure Ulcers (PU) is indeed a threat . Among the victims, 73% are found to be in the age group of 65 years and above. PU is also prevalent in patients under intensive monitoring (patients in ICU) and it is said that 28.7% of the ICU patients are prone to develop these sores . The affected patients experience pain, discomfort, increased morbidity, secondary infection, increased mortality and diminished quality of life. There exists a link between nosocomial PU and mortality. Early detection and optimal treatment of PU is therefore absolutely necessary. It is relevant to remember the adage “Prevention is better than cure” This lies exclusively within the nursing domain [3-6]. In spite of various treatment methods for PU, the patient does suffer and often results in fatality due to pressure sore. The major complications of pressure sore are pain and discomfort , the patient who had developed the sore is susceptible to other secondary infections like sepsis and osteomyelitis leading to increased mortality , surgical reconstruction became the treatment of choice for them often prolonging the hospital stay  all these lead to lowered self-esteem and altered body image . As early as 1930, in order to prevent formation of pressure sores, the senior nurses instructed their colleagues to turn the pillows of patients at a rate of frequency to prevent formation of pressure sore . As this was only rudimentary, subsequently, in 1988 Barden scale was framed which was used by the nurses to calculate development of pressure sore and the rate at which the patients need to be turned, was decided accordingly. On an average, patients were turned sideways for every 2 hours to prevent the formation of sores. However, during the nights, due to the absence of medical attendees, the turning of the patients at regular intervals did not happen with the result that it failed to provide accurate prevention of pressure sores . In order to relieve the pressure sores to the maximum extent, several interfaces were designed to provide more cushioning effect Water bed was designed and this included a heating chamber which circulated warm water is maintained at a particular temperature . In 1975, a liner was designed with a liner restrainer which comprises of an extruded synthetic resin clip having a leg portion for retaining the clip in position relative to the interior surfaces of a water bed frame, a central portion bowed to provide a storage space and a spring bias and a head portion for bearing against the frame . This bed suffered from the disadvantage in that it could not elevate the patient whenever needed. Further improvements were made in subsequent design of a bed by which the patient could lie in an inclined position . This bed resulted in more wear and tear beneath the trunk and gluteal regions because of shear and friction forces. Hence, in later bed design had a flexible container for a waterbed of non-uniform depth with maximum depth at an intermediate location with its ends and tapering away to minimum depths at and near said ends this provides more support to the intermediate regions . Initially the interfacing surface was filled with hot water and the materials used as cushions were such as to maintain the temperature so as to prevent the chance of ulcer formation. It was then designed to provide heat from an external electrical source . Further improvement used buoyant force to relieve the pressure . Maintenance of this waterbed was not simple. In order to make it simpler, further bed designs provided for an airbed mattress and support system including an air reservoir and a device for controlled delivery of air to the airbed mattress. The user had the flexibility to control the air pressure in the airbed mattress . In early 1990’s this mattress came into market and were called ‘alpha beds’. In order to provide more support and cushioning effect, foam containers were designed  and later it was improvised with pulsating liquid foam container which would mimic an air circulating system . • The changes made to the regions not subjected to pressure. • The produced skin changes later developed to sores due to the above defects. • Failure to shift to new position and to relieve the pressure. It is expected that this article, along with reviewing of existing technology also proposes a method for an automated shift of the underlying pressure upon its detection. It provides robust treatment and also reduces the labour and the cost of treatment that would be of great help to bed ridden patients. Figure 1. Schema of experimental prototype. • Patient contact system (PCS) comprising of the outer inflatable and inner deflatable rings. FSR is interfaced with MCU which is programmed to control the MAU based on a set threshold and MAU is further interfaced with PCS. The working logic of this system is explained in flowchart given in Figure 2. Figure 2. 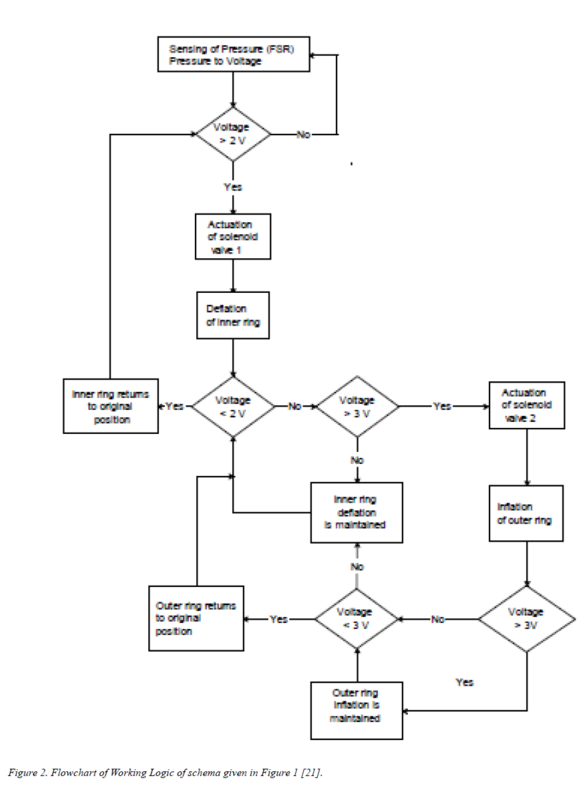 Flowchart of Working Logic of schema given in Figure 1 . Two thresholds of pressures recorded in terms of voltage were chosen to be 2 V and 3 V. When pressure is sensed below 2 Volts in the Pressure Vulnerable Region (PVR), the situation is considered favourable and nothing untoward would happen. When pressure gets accumulated, the equivalent recording rises above 2 V, the MCU actuates the solenoid valve 1 which deflates the inner ring and by which the patient contact surface is depressed and the pressure is relieved. This should eventually reduce the voltage below 2 V and the activation unit should return to original position. But in real time scenario, this might not happen always as there could be dragging of skin because of shear leading to increase in voltage beyond 3 V. In such a condition, the solenoid valve 2 is actuated and this inflates the outer ring. This would raise the surrounding tissue and by which the PVR is now off pressure. This process is maintained till the pressure sensed over the PVR drops below 3 V after which the outer ring returns to original position. When the voltage drops further below 2 V the inner ring returns to its original position . However, this method or mechanism of shifting the pressure might not be favorable as it might pose more stress on skin surrounding the region that is getting relieved of excess pressure. Utmost care should therefore be taken to avoid shifting of pressure to a region of lower vulnerability while relieving it from the region of high vulnerability. This is important as it might predispose the lower vulnerable region to ulcer formation. In view of this, another mechanism was proposed, where mattress surface was segregated in matrix fashion based on the vulnerability of the underlying region as depicted in Figure 3  and the chance of ulcer formation is presented in Table 1. Figure 3. 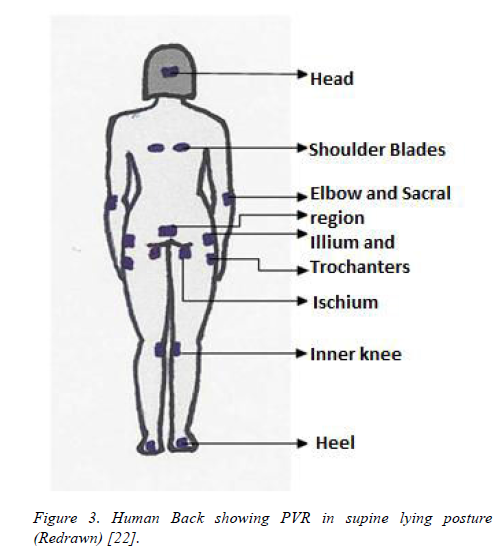 Human Back showing PVR in supine lying posture (Redrawn) . Table 1. Probability of occurrence of pressure ulcers in pressure vulnerable regions . 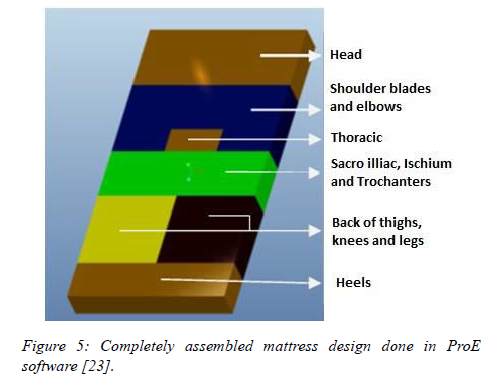 Studies were conducted to match the position of these regions on to the surface of mattress to identify the suitable layout of bed so that the pressure shifting could be done efficiently. A small variation was made in the overall system design as given in Figure 4, where, microcontroller is set at a particular threshold equivalent to 30 mmHg pressure. Case 1*: When pressure gets accumulated beyond the set pressure in high risk region (2a), the excess pressure is sensed (at 3a) and the input voltage to the microcontroller in port 1 (at 6) will increase and this would generate a trigger in motor (7) so that it depresses the mechanical segment (5). Now the pressure is redistributed and the transduction voltage (at 3a) will drop eventually and the once pressure drops below 30 mmHg, the motor rewinds and it will return segment (5) to original position. This will continue till the pressure gets redistributed in the body segments that overlie the moving segments. Case 2*: When pressure gets accumulated beyond the set pressure in low risk region (2b), the excess pressure is sensed (at 3b) and the input voltage to the microcontroller in port 2 (at 6) will increase and provided the voltage in port 1 is below the set threshold, this would generate a trigger in motor (8) so that it elevates the mechanical segment (4). Now the pressure is redistributed and the transduction voltage (at 3b) will drop eventually and the once the pressure drops below 30 mmHg the motor rewinds and it will return segment (4) to original position. This will continue until the pressure gets redistributed and this will also check if the high risk region is not put under stress thereby relieving pressure from low risk regions lying over the fixed mechanical segments without causing damage to the high risk region . Following the electronic scheme, pressure shifting mechanical module was designed which will decide the direction of pressure redistribution. Considering the fact that few regions are at higher risk and few are at lower risk of developing ulcers, the bed surface is divided into six segments and is designed using Pro/Engineer software tool as is given in Fig 5. Mattress segments 1, 3 and 6 shown in Figure 5 are fixed and will contain the sensing element to check accumulation of pressure even in the low risk regions. The other segments 2, 4 and 5 as shown in Figure 5 are movable modules and are controlled by the microcontroller, based on the pressure sensed and the region involved. The regions of body monitored by these 6 segments and number of motors needed to monitor them are tabulated as shown in Table 2. Figure 5. Completely assembled mattress design done in ProE software . Table 2. Mattress segments and the supported pressure vulnerable regions of body . Understanding the orientation thereby led the authors to design the mechanical module/ interface using Pro/Engineer Wildfire 5.0 to redistribute the accumulating pressure from high risk region to low risk regions. Furthermore, these mechanical modules have to be fabricated, interfaced with electronics to achieve the validation of concept in the future. In this article, various available technologies incorporated in patient interface namely, water based, foam based, air based mattresses have been discussed with their merits and demerits. A novel technology proposed for achieving sensor based automated pressure shift was analyzed in detail and its limitation in exposing the low pressure vulnerable region to pressure ulcers was also discussed. Based on this limitation, another design in interface was proposed and discussed. The working logic involved in distribution of pressure being achieved by linearly shifting the interfacing segments was kept unchanged in this design. Comparative summary of these methods were presented in Table 3. This design has to be implemented to provide a better insight into technology that would be efficient in redistributing the excess pressure from high to low vulnerable region and also having a check on later so that they are not predisposed to ulcers. Hall CP et al. 1971 Liquid support for human bodies US Patent No 3585356 Invention focused on usage of liquid as cushion. May MI 1975 Water bed liner holder US Patent No 3973282 Proposed that water should be circulated within the bed in order to disperse the generated metabolic heat. Phillips RM 1976 Mattress having an upper internal material-containing chamber US Patent No 4068335 Splitting up of the bed was done but it was not controlled by any graded mechanism to ascertain the shift of pressure. Shear was not addressed. Charles P. Hall 1981 Waterbed mattress with unattached baffle structure US Patent No 4399575 Limits excessive sagging while the mattress is subjected to pressure. In due course it will also limit the amount of pressure that can be relieved. Mollura CA 1986 Airbed mattress including a regulated, controllable air reservoir therefore US Patent No 4679264 Pneumatics was used and had more wear and tear. Table 3: Comparison between the available methods and the proposed method [24-37]. Lyder CH, Preston J, Grady JN, Scinto J, Allman R, Bergstrom N, Rodeheaver G. Quality of care for hospitalized Medicare patients at risk for pressure ulcers. Arch Intern Med 2001; 16: 1549-1554. Maklebust J. Pressure ulcers: the great insult. NursClin NA 2005; 40: 365-389. Whittington K, Patrick M, Roberts J. A national study of pressure ulcer prevalence and incidence in acute care hospitals. J Wound Ostomy Continence Nurs 2000; 27: 209-215. Graves N, Birrell F, Whitby M. Effect of pressure ulcers on hospital stay. Infect Control HospEpidem 2005; 26: 293-297. Schultz A. Predicting and preventing pressure ulcers in surgical patients. AORN J 2005; 81: 986-1006. Redelings M, Lee N, Sorvillo F. Pressure ulcers: more lethal than we thought? Adv Skin Wound Care 2005; 18: 367-372. Hopkins B, Hanlon M, Yauk S, Sykes S, Rose T, Cleary A. Reducing nosocomial pressure ulcers in an acute care facility. J Nurs Care Qual 2000; 14: 28-36. Brown G. Long-term outcomes of full-thickness pressure ulcers: healing and mortality. Ostomy Wound Manage 2003; 49: 42-50. Institute for Healthcare Improvement (IHI). Relieve the pressure and reduce harm. Centers for Medicare & Medicaid Services (CMS). Eliminating serious, preventable, and costly medical errors-never events. Morison M. Prevention and treatment of pressure ulcers 2001. Loretz L. Primary Care Tools for Clinicians 2005; 398. Rintala DH. Quality of life considerations. Advances in wound care 1995; 8: 28.71-28.83. Baharestani MM. The lived experience of wives caring for their frail home-bound elderly husbands with pressure ulcers. Advances in wound care 1994; 7: 40-52. LaRossa D, Bucky LP, Witkowski JA, Crissey JT. The decubitus ulcer in clinical practice, Springer 1997; 84. Hall CP, Calif MB. Liquid support for human bodies 1971. May MI. Water bed liner holder, US Patent No 3973282 1975. Phillips RM. Mattress having an upper internal material-containing chamber. 1976. Colwell DJ. Waterbeds, US Patent No 4127908. 1976. McMullan JP, Lindsay RE, Land JE. Water bed with heater, US Patent No 4233492. 1979. Hall CP. Waterbed mattress with unattached baffle structure, US Patent No 4399575. 1981. Mollura CA. Airbed mattress including a regulated, controllable air reservoir therefor, US Patent No 4679264. 1986. Stanley E, Stanley K. Fluid saturated foam container, US Patent No 6128795. 1999. Stanley ED, Stanley KA. Pulsating liquid saturated foam container, US Patent No 6491717. 2000. Bhattacharya SS. Intelligent Monitoring Systems-Smart Room for Patient’s suffering from Somnambulism (sleepwalking), 2nd Annual International IEEE-EMBS Special Topic Conference on Microtechnologies in Medicine & Biology. 2002; 326-331. Gaddam A, Mukhopadhyay SC, Gupta GS. School of Engineering and Advanced Technology Massey University, Palmerston North (2008) Necessity of a Bed-sensor in a Smart Digital Home to Care for Elder-People, in New Zealand at IEEE Sensors 2008; 1340-1343. 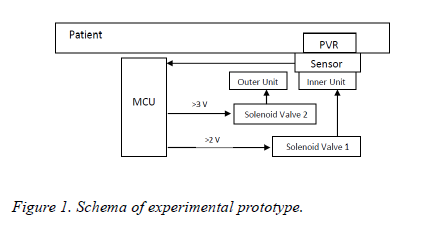 Arcelus A, Goubran R, Sveistrup H, Bilodeau M, Knoefel F. Context-aware smart home monitoring through pressure measurement sequences, in proc. IEEE International Workshop on Medical measurements and Applications (MeMeA) 2010; 32-37. Carvalho MAF. Monitoring and control system of discomfort in disability, bed rest people and surgical patients. Advances in Science and Technology 2008; 60: 164-169. Jaichandar KS, Martínez García EA. Intelli-Sense Bed Patient Movement Sensing and Anti-Sweating System for Bed Sore Prevention in a Clinical Environment. 2011. Peterson MJ, Adkins HV. Measurement and Redistribution of Excessive Pressures During Wheelchair Sitting: A Clinical Report 1982. Hughes RG. Pressure Ulcers: A Patient Safety Issue. 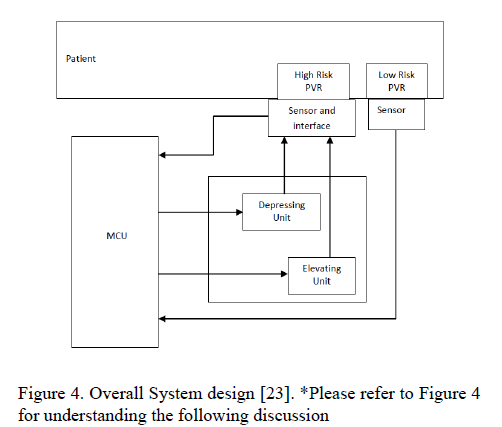 Nageswaran S, Vijayakumar R, Sivarasu S. Design Evaluation of an Automated Bed for Early Detection and Prevention of Decubitus Ulcers in Nonambulatory Patients. J Med Devices 2014; 8. Willock J, Hughes J, Tickle S, Rossiter G, Johnson C, Pye H. Pressure sores in children-the acute hospital perspective. Journal of Tissue Viability 1999; 10: 59-65. Jones I, Tweed C. Pressure area care in infants and children: Nimbus Paediatric System. British Journal of Nursing 2001; 10: 789-795. Murdoch V. Pressure care in the paediatric intensive care unit. Nursing Standard 2002; 17: 71-76. Maire YL, Delcey M. Pressure Sores and Other Complications of Immobilization. Nageswaran S, Vijayakumar R, Sivarasu S. Design of Mechanical Interface to Re-distribute Excess Pressure to Prevent the Formation of Decubitus Ulcers in Bed Ridden Patients, Engineering in Medicine and Biology Society.